I love making cards!!! Besides being in the kitchen the craft room is my second favorite place in the house. Lately I have been making this type of cards for baby shower gifts. Its cute and simple to make. I just did a Google search and found a template and instructions here. These ladies are very beautiful and cute with the ruffled edges. I don't have that fancy stuff so this is what I did with just a template (that the one above). After cutting the design out I glued on this pretty patterned patter, inked the edges, attached these cute snaps I found at the dollar store, and labeled it with a letter for the baby's last name. 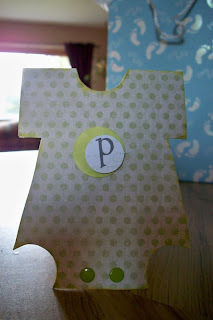 These cute little baby cards are a great accompaniment for any baby gift. For more works for me ideas check out we are that family! Friday night here is always take out style food so to go along with that, my wonderful husband, made us a banana split!!! 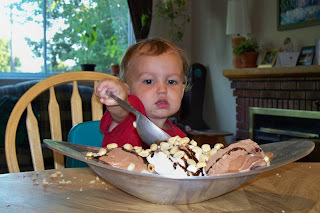 It was very creative of him to put it in this big salad bowl. There was lots for all of us seeing how our family is only the two of us and our little guy who isn't even two yet! hehe. 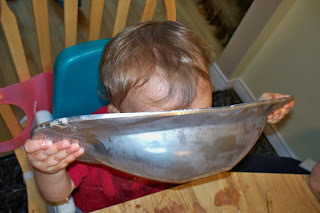 The babe doesn't get treats like this a lot, can't you tell, so he really enjoyed cleaning out the bowl!! This will definitely become and family treat for us as its much cheaper then going out for ice cream! So last Friday I was way to busy to post anything cause I was working on this little project!! 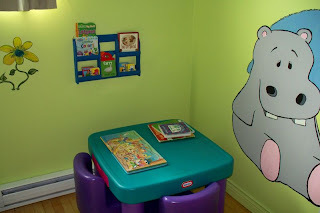 I had been saying to hubby that I wanted to get a small book shelf for the babes room. One that could hold those little books and eventually flash cards. So with that thought imprinted in my head I headed out to value village for their 50% off day!! 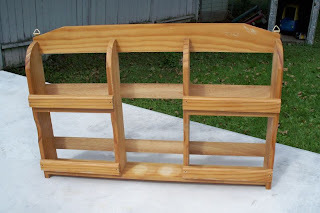 While you can image my great delight when I spotted this old spice rack for $2.00 (price after 50% discount)!!! When Micah got home I was so excited to show him and let me know my dreams for this gem. The next day I headed out to the dollar store to pick up some blue paint and brushes so I could get to work painting it up nice. So after two coats of paint here is the babes new little book shelf (I did for $4) for his new big boy room! 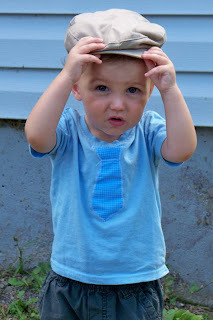 I don't know about you other moms with boys but dressing them up with a tie is not my favorite thing. As soon as I put one on this little guy he is trying is hardest to get it off. So that is where this very cute shirt comes in handy. I have seen them many times of different sites but this is where I got the tie patterns from. 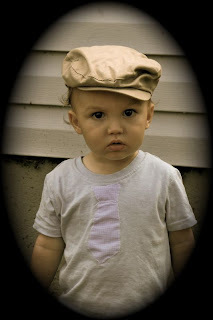 For some reason, defiantly not from his mother, he doesn't like the camera and it takes a fast finger to get a good shot of him. See how fast it went from good (I like the editing) to bad..hehe.. He looks so cute with this shirt on and no taking off the tie. He is so stylish. These are also great to give away as baby gifts for those new little guys as the tie can be sewn onto any size onesie or t-shirt. And if you don't sew and live in this area my friend sells the T-shirts at Smilebugs Baby! So we just got back from apple picking. 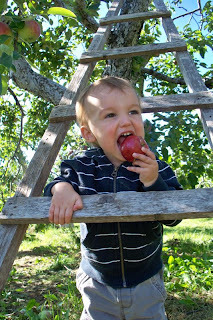 Last year the babe was a little less mobile; making it easier to pick more apples. This year he was a big help..to the orchard that is as he tried to eat just about every apple he found laying on the ground. So now I am home with 24 lbs of apples and a sleeping boy. Giving me just enough time to search through my blog to find some recipes and ideas. 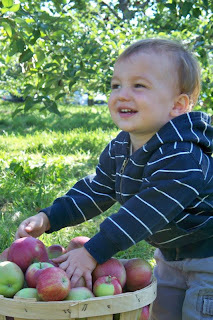 Here is my apple picking/recipe post from last year. I am sure I will be creating new things so look forward to seeing them! oh ya and this is going to help me so much this year!!! I am so glad that I have now set aside one hour a week to work on my meal plan so I don't have to think about it on Sundays! Here is what we are cooking up this week. So my new Cricut has come in handy in more places then just the craft room. Ever since I saw an infomercial on it I wanted one just to use for vinyl lettering. 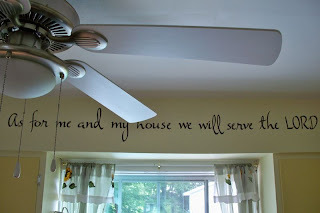 So now with my own Cricut here is my new kitchen decor. I am back...sorry readers I guess I forgot to mention that I was going to be away last week. I was in the big city of Toronto taking a training course for Home with a Heart. I had a great time but now I am back to work meal planning up a storm. This time of year is so busy for me around here because I am re organizing everything. I started last week cleaning out the cupboards and making my bulk barn list of spices, herbs and baking supplies that need to be replenished. I am still loving my "baby jar" system. 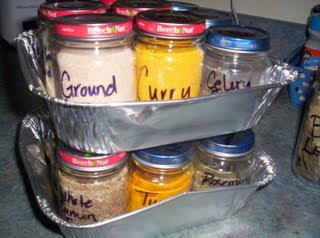 I was finding it difficult to remember where the spices where and which container I had place them so I made two list which are now attached to the inside of my cupboard with all the spices in the "bottom" and "top". 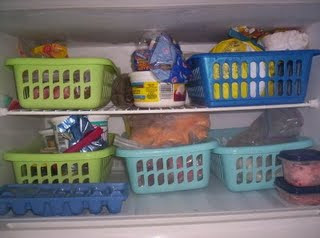 I have also been cleaning out the freezer and doing the basket organizing in there again. 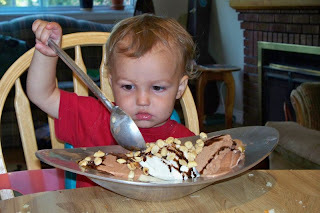 Now that the babe doesn't have any special pureed food it can be used for something else. I think I replaced it with home made convenience foods like pizza pockets, fries, burritos and pigs in a blanket. Now that I am organized again we will be stocking up on lots of fresh veggies and fruit to freeze for the winter. 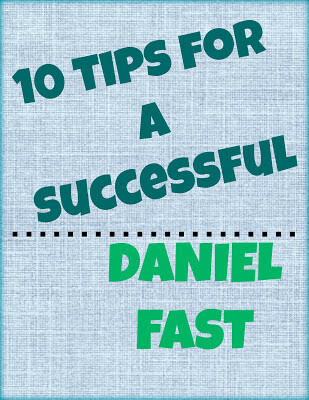 For more great organizing tips head on over here.